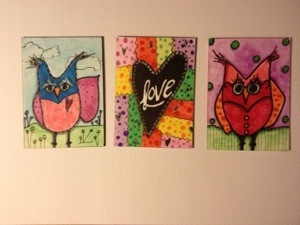 In preparation for May’s Whimsical Women show in Cary , these are some of the magnet designs. Owls surrounded me in college as part of my sorority’s identity. They used to make me nuts until I started making them whimsical… I like their new identity . Happy Paint Party Friday ! These are wonderfully creative, colorful and adorable! Lovely! I much prefer whimsical owls to the real things! Congratulations on the upcoming show!! owls are very much ‘the thing’ right now…yours are fun! well done…HPPF!